Japan. The only place where a normal end to a conference is to get naked together in one big bath. I was at a three day "Leadership Workshop for Female Faculty" which --despite its rather wooly title-- has consisted of well thought-out sessions covering each of the main roles in a faculty position; conference presentation, academic writing, course design and mentoring. It was held at a Hilton hotel situated at the foot of the Mount Yotei; an active stratovolcano sometimes referred to as 'the Fuji of the north' due to the physical resemblance with its famous southern cousin and the similarly exciting possibility of violent death by lava. So far, however, I had not appreciated either the scenery of the luxuries of the hotel. 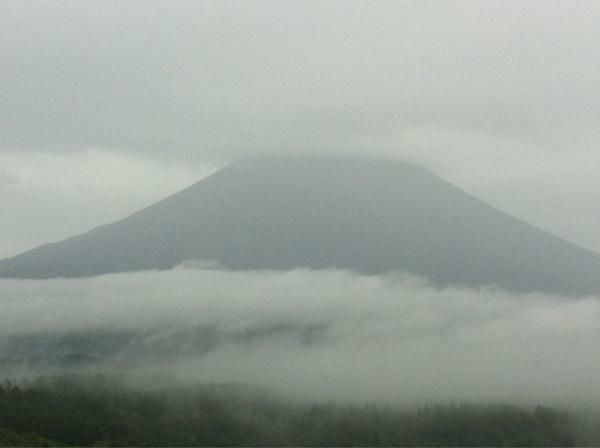 As soon as we left Sapporo, fog had swept over us in an exciting bid for Autumn. When I pulled back the curtains in my hotel room this morning, I had to raise a hand to check I wasn't missing an extra net blind that had turned my view to white. I had not: oblivion was outside my window. Normally, there is a mountain. I've heard it's ace. Still, the workshop itself was not for mountain gazers. We were timetabled through until 11 pm (not a typo), where the last session was listed as 'optional' but with a footnote that made it clear it was as missable as potty training. Fortunately, everyone treated the long hours with an element of humour that causes you to band together to form a brave front. Plus, they compensated us with food. I'm going to have to be rolled out the door tomorrow. Wrung through and full of information, I headed down to the hotel's onsen to relax in the hot spring waters. There's the benefit of the active volcano; possible horrifying death, but great baths until then. This was the point where I caught up with the rest of my colleagues and I had the very genuine problem of recognising them without their clothes on. To go to and from the onsen, the hotel had provided traditional Japanese yukatas; a simple version of the kimono typically worn during the summer or while visiting the onsen. Overheating in the 42 C water, one of my non-Japanese (this fact will become important shortly) friends and I bade everyone goodnight and went to dry off, folding our yukatas around us and tying them closed at the waist. "You've tied it wrong," she indicated the yukata, where we'd folded the right edge over the left. "That is only for dead people!" Either it was a mistake, or it was an unconscious reflection of how we felt at the end of that day. Photo was the best I managed from my window during a semi-break in the fog. While in the west, right over left is the feminine and left over right is the masculine. Holy clashing clothes coordination! I like the valuable info you prοvidе in your artіcleѕ. I'll bookmark your weblog and check again here regularly. I am quite sure I'll learn plenty of new stuff right here! Bеst of luсk for the next!